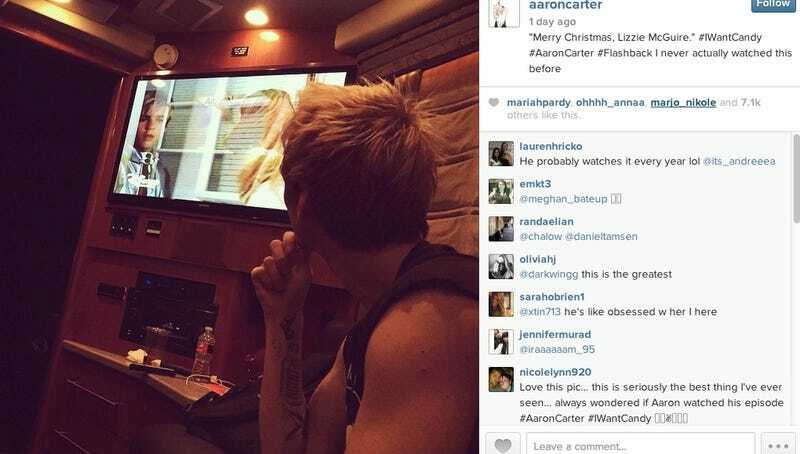 This is Aaron Carter, the experimental prog-rock auteur behind "Aaron's Party (Come Get It)" and "That's How I Beat Shaq," publicly broadcasting to the world of social media that he is watching old episodes of Lizzie McGuire, Disney's 2001-2002 French New Wave-inspired dramatic miniseries starring Carter's ex, Hilary Duff. "'Merry Christmas, Lizzie McGuire.' #IWantCandy #AaronCarter #Flashback I never actually watched this before"
The episode he is watching stars him, Aaron Carter, as himself, Aaron Carter, and it is called "Aaron Carter is Coming to Town." In it, he smooches his now-ex, who at the time was his real-life girlfriend. See? With Instagrams like this, he seems well on his way. Good luck, Aaron Carter. Please pray for Aaron Carter in this difficult and trying time as he continues to not let Hilary Duff live her life in peace. Important update: Aaron Carter he mad. Mad enough to delete this tweet.